I see. .profile or manually copy paste. Won't be in here for a while. Maybe dfort takes a look before me. 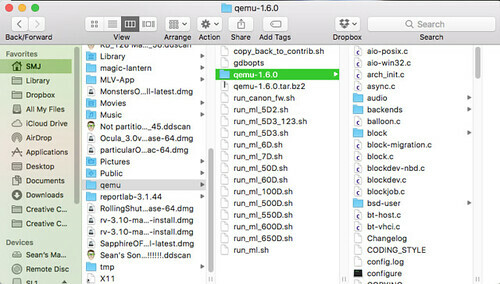 This will setup QEMU for emulating Magic Lantern. Reusing existing connection to wiki.qemu-project.org:80. The file is already fully retrieved; nothing to do. you will rebuild ML from scratch. 4) Create a subdirectory named 'sdcard' or 'cfcard' and copy ML files there. Make sure all ML files are UPPERCASE (just copy them from a FAT32 card). Does this mean it's some kind of a success? make: *** No rule to make target `/qemu-options.hx', needed by `qemu-options.def'. Stop. Please call configure before running make! Did I miss a step in here? @DeafEyeJedi -- You keep running the error message. Don't just blindly copy and paste. Read what it says first--grep is trying to tell you something is wrong! [EDIT - removed the suggestion to use "rm -rf *"] Got anything left in there? It is ok to get rid of it if you're going to do a new Homebrew installation. I'd do it a step at a time, you don't want to force remove everything if you're in the wrong directory! Now run the quick install script on the first post--I keep updating it with the latest suggestions. *** Please add gcc binaries to your executable PATH. *** Please set up a valid arm-none-eabi-gdb before continuing. *** WARNING: 64-bit GDB is known not to work. I wouldn't run rm -rf * on anything. What if the folder usr/local doesn't exist even? Make sure you're in "/usr/local" -- in any case I edited my post even though I did put in a warning about using "rm -rf *"
Thanks @Danne for the suggestions (especially on not using rm -rf * on anything) and @dfort for the comprehensive details. I will report my findings once this shitstorm of mine settles down this weekend. This also reminds me that I should be looking for an old used MB Air to do this kind of work where there are no important files on the system for future references. Take a beer and enjoy it! Glad to help you minor contribution for all your great works! Happy to see Mac development on top level! Looks like it is time to rebuild my QEMU environment. Thanks for making ML development on Mac so easy--well setting up the environment is easy, the rest is still pretty hard. Hunk #1 succeeded at 228 with fuzz 2 (offset 12 lines). everything seemed kind of stalled. The titlebar of my Terminal window was looping through multiple commands, but this kept going for like 10+ minutes. I wasn't sure if this was normal behavior or if it was stuck in some loop. I can post a screen video grab if needed. I ended up stopping all the processes and killing them. I read on a prior post here that someone said something took 37 minutes to complete, so perhaps it wasn't looping but I just need to wait for it to complete? If so, it would be useful to update the install instructions and let folks know that it may take a while to complete this step. Any confirmation would be helpful. Thanks. I'll need to update the tutorial. The stall you're experiencing is the compiler compiling a compiler from scratch. It takes a long time but if you let it keep running it should eventually finish and work. There should be a binary version available so that shouldn't be necessary. I'll update this topic when I get things working properly again. Awesome. Thank you. By the way, while I was puttering around, I decided to try running the full script at the bottom of the article and that seemed to complete everything with no issues and without the long wait. Not sure why (perhaps most of the work was completed the first time through). All good now. Thanks for the quick response. Glad you got it working. I reworked the script to accommodate that gcc@5 change in Homebrew and while I was at it improved the QEMU installation. The script can be run even if you have a development environment already setup, it won't clobber your current installation (I hope). You're right -- removed the symlink. Thanks for the update. Have you noticed that the script can now install QEMU from soup to nuts? Ran the latest scripted installation from OP while on 10.13 w this MBP that already had previous compiling environments. Love it that it can also install QEMU as an option towards the end. Seems all good to me even w the PIP update command that I ran (hence the in video above) afterwards w ease. Thanks @dfort for the quick fix after @henrus's report. Good catch on that! Great video @DeafEyeJedi - I like your choice of colors. HELP! I’m trying to sink my teeth into compiling but I’m hitting a snag, I’m at the part where you ask to modify Makefile.user.default. But I don’t see that file or all the different filed you ask us to edit as we go, so I’m kind of stuck after “brew install docutils”. I think I’m going to start over again but I just wanted some advice. Are you running the quick installation script from the bottom of the first post? The makefile you're referring to is in the root folder. Just copy it and rename it to Makefile.user and put in the suggested changes. Here's a little secret -- you don't even need this for compiling ML. However, sooner or later you'll want to compile cr2hdr and you'll tear your hair out trying to figure out what is going on and it will always end up that you are missing this Makefile.user file. Danne just published Compiler.app, a menu driven app that simplifies setting up and running an ML development environment. He included the quick install script and started tweaking it to make it more user friendly. So instead of having the quick install script located at the bottom of the first post in this topic it is now on Bitbucket which means it is under full revision control and will be managed just like a "real" program. It can still be run as a stand alone script. Check the bottom of the first post to read how to download and run the script using the terminal. But just wanted to check if this is going te be fine or if I can encounter new problems. Yesterday I found this interesting program called 'butterflow' it can interpolate intermediate frames. I wanted to test it how it works on 12.5 FPS UHD file, and if I can get it to 25fps with this program. brew install brewsci/science/butterflowA lot got installed on the way and in the end I could not get the programming to work. Too bad that I couldn't get it to work, BUT when I wanted to compile a new crop_rec module file from magic lantern, I got a new error, and it didn't compile the module. After a lot of trial and error and reinstalling gcc and python (which gave messages that it was already there) I found out that there wasn't a file named 'python2' in my usr/bin/ directory. And now I can compile again, but the weird thing is, the butterflow installation couldn't mess with the make.user.file. So apparently I was running on python 2 and the butterflow installation messed things up, maybe overwritten python files with newer or older versions ? Is this fix I did a good solution, or is it a bit messy ? Butterflow probably changed your python paths. What do you see when running this? python -c "import sys; print('\n'.join(sys.path))"
brew install python2Might ask to relink or so if somethig was messed up.